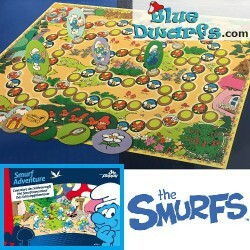 > Other smurf items>Smurf Boardgame: The big smurf adventure! Smurf Boardgame: The big smurf adventure! Someone sneaked into the village at night and took the smurfs' favorite things. Was it Jokey smurf?Or maybe Azrael the cat? The smurfs set out on a journey to recover their lost items. How will this smurf adventure end?